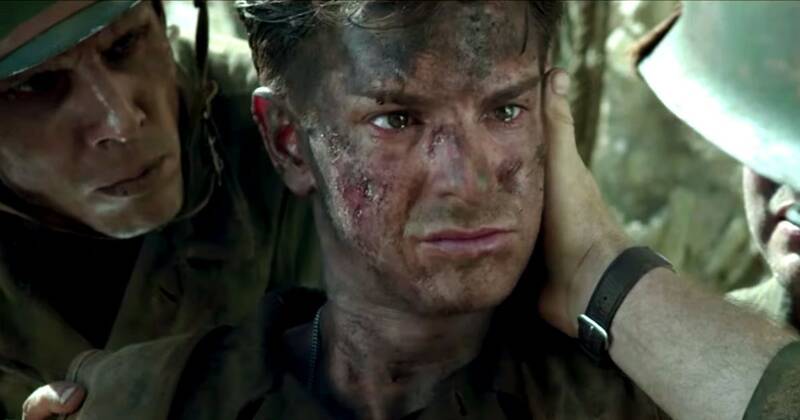 Gibson’s fifth directorial feature tells the tale of Desmond Doss (Garfield), the first conscientious objector to receive the Medal of Honour during World War II. A devout man, Doss’ stance on killing stems from his childhood experience of nearly killing his brother when he brought a brick to a fist fight. Coupled with experiencing a eureka moment when saving someone from a debilitating accident, he sets his sights on becoming a medic in the war effort, whilst refusing to fire a single shot. Biopics such as this deserve to be made.They hold a magnifying glass to the way the majority of modern lives are spent, which is in stark contrast to the sacrifices made by those who came before. They survive as a moving memorial to previously unsung heroes. So why does this film leave such a saccharine taste in the mouth? Perhaps the above musical outburst is the product of a certain cynicism around the motivations of making the movie. However, with that being said, it seemed a disservice not to judge the movie on it’s own merits from this point onwards. 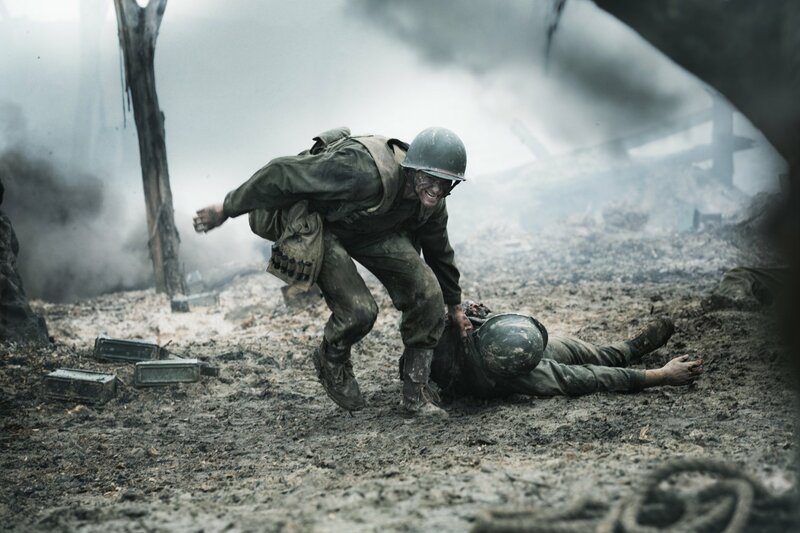 Hacksaw Ridge wastes little time in sending us over the top. And it’s a horrific affair. In a scene that rivals Saving Private Ryan‘s opening salvo, bodies are dismembered in never-seen-before ways and the shots of slow-motion soldiers engulfed in flames are beautiful in their brutality. However, just as quickly as we’re thrown into the fray, we’re taken back to Doss’ childhood. Desmond’s father and former serviceman Tom (Weaving), is frighteningly effective as he struggles to come to terms with the loss of his own brother in World War I, abusing alcohol and his family as a result. Although harrowing, it is not without humour though, never more so than where Tom refuses to intervene in his offspring’s fisticuffs, claiming; “Saves me whupping ’em both. I’ll just whup the one that wins.” Garfield himself is on unprecedented form as Doss; he skilfully balances his pacifist sentiments without being sanctimonious and the developing relationship between him and Dorothy (Palmer) is genuinely endearing and believable. As Doss signs up however, the film becomes standard army fodder and it soon starts to fatigue. The introduction of Doss’ unit feels rushed where the characters are unfortunately forgotten as soon as they are off-screen, but in stark contrast Vince Vaughn’s Sgt.Take it to tHowell is best forgotten as the by-the-numbers drill sergeant. Numerous training montages, bloody beatings and court-martial proceedings fail to force Doss out of the army or change his stance on killing and soon we’re back to where we started: in the midst of battle at Hacksaw Ridge. This is where the tide turns. The madness of war is emphasised by the ludicrous logistics of the assault itself which would be poo-pooed if the story wasn’t true, but there is also poignancy aplenty. One such scene sees fresh units being sent to the frontline, trudging past those they are replacing; some wounded, some not so lucky. It’s here that the reality of the situation kicks in as both the viewer and his fellow soldiers witness Doss’ stunning heroism. The battle itself falls short of the emotional heft you’d expect though due to Doss being the only fully developed character, but this is of course his story. This is somewhat made up for by the final talking heads interviews with the real Desmond Doss, his brother Hal and Captain Jack Glover and the lasting impression is of a truly inspirational individual in unimaginable circumstances.